In your practice today, there are dozens – if not hundreds – of patients with whom you hardly ever speak. They visit your office twice a year, say hello, sit through their prophy appointment and head back to school, home, or work, oblivious to the difference you could make in their life. To them, you’re just someone who cleans teeth. To you, they represent a lost opportunity. A lost generation, perhaps – of patients shifting between adolescence and adulthood who may not have much money, but who wield far more influence than you could imagine and know virtually nothing about the elective services you can provide. Not including this diverse group of 16- to 24-year-olds in your marketing mix is a mistake. When you were a kid, businesses that wanted to reach you had to run product and service decisions through your parents and hope they trickled down to you over time. Today, with every teen running around with a cell phone in their pocket, reaching the youthful influencer is easier than ever. So what are you waiting for? Sixteen-year-olds in America make a lot of decisions for themselves. Many drive, have jobs, and at least a little bit of disposable income. In fact, if they have any income at all, it’s fairly safe to say it’s all disposable income. What’s more, each of these “kids” is a powerful influencer of their family’s much larger healthcare budget. Don’t ignore them – especially when they tend to remain on their parents’ insurance policies until they’re 26! Despite what adults might think, this generation knows how to look out for themselves – and can actually motivate their parents to bring them in for a cleaning (or come in themselves). After all, selfies always look better when you have beautiful teeth, right? Recall – Once your patients reach the age of 16, you should start collecting their own (not their parents’) contact information. 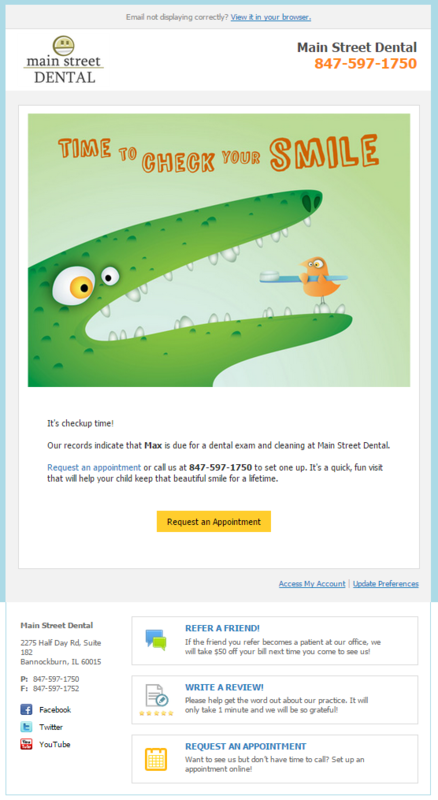 Recall announcements like the one below should be sent directly to younger patients overdue on hygiene. 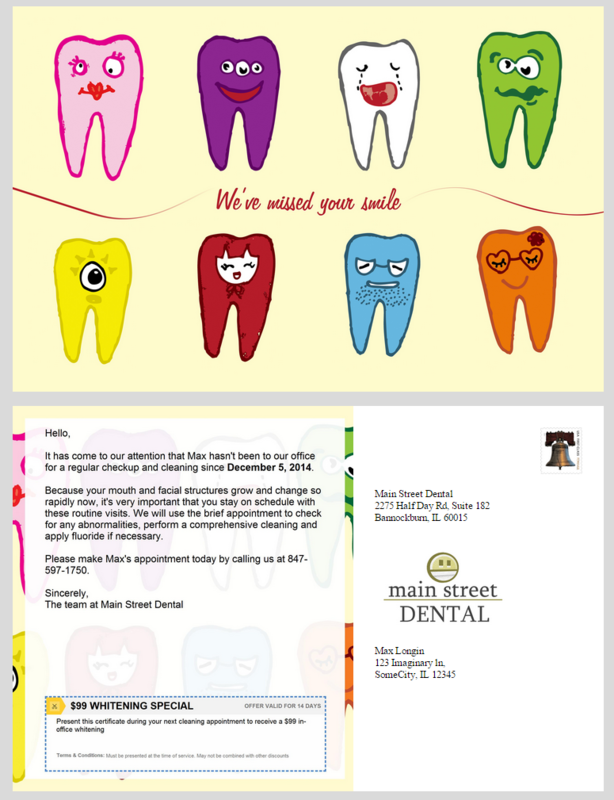 Patient Reactivation – If you have a number of 16- to 24-year-olds who haven’t been in to see you in a while, sending them a postcard or an email can work very well. 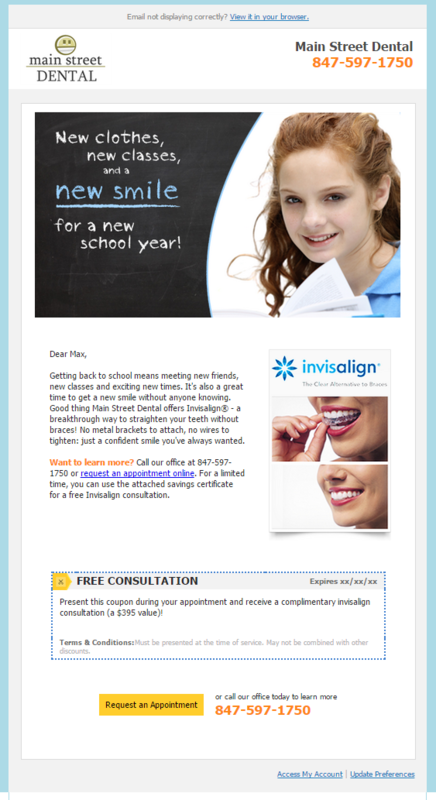 One way to make the message hit hard is to come up with a creative incentive – like a teeth whitening promo, or movie tickets for those who make an appointment in the next 2 weeks. Get them excited, and you’ll get them in the door. For many in this demographic, getting braces has been a rite of passage they’ve been looking forward to experiencing for years. Others have been dreading the traditional braces, and would love to find out about alternatives like Invisalign Teen or Six-Month Smiles. Let them know about the different types of braces on offer at your office, and educate them on the benefits of each system. 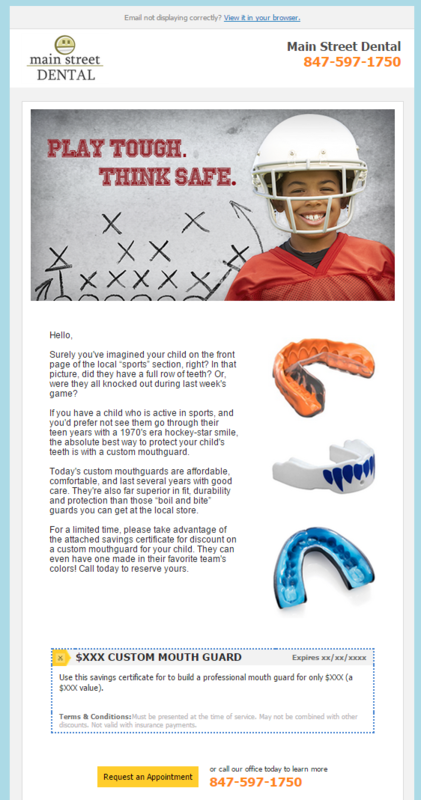 On the whole, this age group is very active in sports and will want to know about your custom mouthguard options. Why? 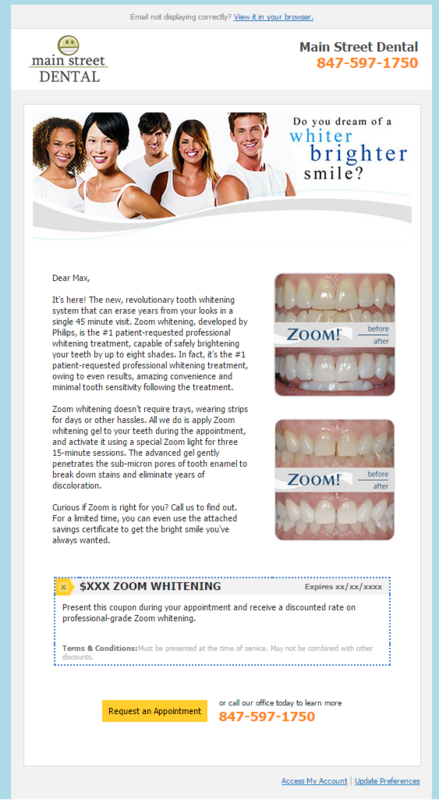 Well, can you think of a more appealing dental topic for a younger demographic than teeth whitening? Sure, adults care about having beautiful white teeth, but teenagers? They obsess over it. Also, because early intervention is likely to yield better results, and in-office procedures can be safer than over-the-counter remedies, speaking about whitening with this demographic allows you to come out the hero on all fronts. In prose, song, film and theater, artists have forever sought to remind us that when it comes to love, hope, and dreams, much of what we seek exists in plain sight. Business holds many similar truths, and if you’re looking for ways to grow your business next year by expanding services to your existing patient base, paying a little attention to those super-influential 16- to 24-year-olds may be a great place to start!